It’s okay everyone! The “Deadpool vs. Vampires” story arc is over! You can all come out now, because with the end of “Deadpool vs. Vampires” comes…DEADPOOL IN SPACE!!!!!! Excited? Of course you are! 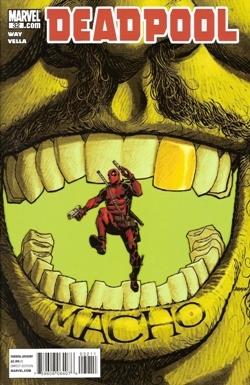 Deadpool #32 is written by Daniel Way with art by Sheldon Vella. This issue is a stand alone story designed to pull Deadpool away from the past two issues which were a tie-in to the “Curse of The Mutants” story arc in X-Men, and to take Deadpool in a new direction. It starts off with Deadpool hanging out in a hotel room, watching TV. He learns on the news that a scientist named Reginald Harris and his family had been killed when their house exploded. Deadpool is surprised to learn that he is the chief suspect, as security tapes show him climbing the wall onto Harris’ property, even though Deadpool was nowhere near the property. Still, the name “Reginald Harris” sounds familiar to Deadpool, he just doesn’t know why. Suddenly, Deadpool is surprised again when his door is kicked in by an alien named Macho Gomez. Gomez was originally hired to kill Harris and blames Deadpool for Harris’ death. Gomez also claims to be far more of a badass than Deadpool, saying, “…where I come from? You ain’t &%$#.” So, Deadpool gets Gomez a big bag of gold coins…which happens to have a claymore mine at the bottom of it. Gomez is blown through the wall and onto the hood of his awesome space car, which Deadpool really wants. Deadpool then decides to find out who’s framing him. He tracks down Harris and his family, who faked their deaths and blamed it on Deadpool. Harris had worked for the government developing alien weaponry. Dissatisfied with the slow progress, Harris hired Deadpool to steal the weapons (which is where the security footage of Deadpool at Harris’ home came from). But, when the aliens who supplied the original weapons came looking for their new ones that the US Government had agreed to develop, they were not so pleased to hear that the weapons were stolen, so the government sold Harris out. So, when Deadpool comes to kill Harris for framing him, Harris hires Deadpool to kill Macho Gomez. Since Gomez is the most feared operator in the galaxy, if Deadpool kills him then nobody else will come after Harris. Deadpool thinks that he has already dispatched Gomez, but that turns out to not be the case. What follows is a truly epic and bloody fight between Deadpool and Macho Gomez. At one point, Deadpool cuts his own arm off and sticks it to a tree as a decoy so that he can sneak up on Gomez. Eventually, Gomez makes his way inside Harris’ safe-house where his escape pod is counting down to ignition. Gomez opens the door to find the pod empty. Deadpool leaps out of nowhere (his removed arm tied to his back), knocks Gomez into the pod and launches it into space. As it’s flying off, Deadpool uses Gomez’s own gun to fire an explosive round at the pod, destroying it and Gomez while Deadpool’s removed arm throws up the horns. The book ends with Deadpool resolving to go back to being a mercenary, since he just killed the biggest badass in the galaxy. The final page of the book shows Deadpool flying off into space in Gomez’s awesome space car. This issue was fantastic. Way knows Deadpool so well and creates such great stories that really make the character shine. He has also set up a fantastic new direction with Deadpool flying off into space to be a mercenary. I can’t wait to see what they do with that. Vella’s artwork is a bit different from what they’ve been doing on this book lately, but I like it a lot. It’s very frenetic and has a lot of goofy, brutal energy. It suits the character very well. It also reminds me of Jon Guillory’s art on Chew as well, only far more wacky and crazed. If you’re looking for a great Deadpool read that doesn’t require a lot of back story, this is the issue for you. It’s a fantastic jumping on point for anyone who wants to read Deadpool stories written by someone who truly knows how the character should be handled.